Theodor Adorno was director of the Institute for Social Research at the University of Frankfurt from 1956 until his death in 1969. 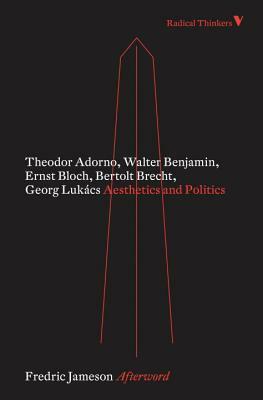 His works include "In Search of Wagner"; "Aesthetic Theory"; "Negative Dialectics"; and (with Max Horkheimer) "Dialectic of Enlightenment" and "Towards a New Manifesto." Walter Benjamin was a German-Jewish Marxist literary critic, essayist, translator, and philosopher. He was at times associated with the Frankfurt School of critical theory and is the author of "Illuminations," "The Arcades Project," and "The Origin of German Tragic Drama." Bertolt Brecht (1898-1956) was a German poet, playwright, and theater director. An influential theater practitioner of the 20th century, Brecht made equally significant contributions to dramaturgy and theatrical production, the latter particularly through the seismic impact of the tours undertaken by the Berliner Ensemble--the post-war theater company operated by Brecht and his wife and long-time collaborator, the actress Helene Weigel--with its internationally acclaimed productions. Georg Lukacs (1885-1971) was a Hungarian Marxist philosopher and literary critic. Most scholars consider him to be the founder of the tradition of Western Marxism. He contributed the ideas of reification and class consciousness to Marxist philosophy and theory, and his literary criticism was influential in thinking about realism and about the novel as a literary genre. He served briefly as Hungary's Minister of Culture following the 1956 Hungarian Revolution.